Bus and train stations in Prague, schedules and connections. You can look up train and bus schedules and connections for the Czech Republic and Europe at jizdnirady.idnes.cz. The results will show all available connections for your route, distinguished by a train or bus icon. See "Useful dictionary" on the bottom of this page for some terms you may need. 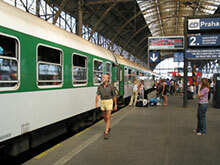 Prague has several train stations. The most widely used ones are the Main Station (Hlavní nádraží), Holešovice Station (Nádraží Holešovice), Smíchov Station (Nádraží Smíchov), and Masaryk Station (Masarykovo nádraží). They are all accessible by the metro and several tram lines. Please visit our Czech Republic Trains page to learn about train ticket discounts, train ticket fare calculator, advance online reservations and international fares. The three most frequently used Prague bus stations are Florenc, Roztyly, and Zličín. If you are coming to Prague on an international bus, you will most likely arrive at the Florenc bus station, which is located at the B/C line of the subway. Be careful if you decide to take a taxi from the train or bus station - please read our tips on Taking a Taxi in Prague. You can move around town easily by public transport - see our Prague Transportation System page or consider getting the Prague Card. Vlak nečeká na žádné přípoje. - The train will not wait for any connections.